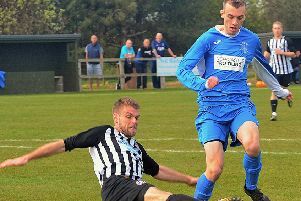 Alex Laviers hit a three-minute second-half double as leaders Rothbury took the points in an important derby victory at the Welfare ground. Returning influential midfielder Tony Brown was also on target and Alex Makin grabbed the other as the Reds maintained their lead over Whitley Bay Sporting Club at the top on goal difference with a game in hand. The success was hailed by player manager Dan Herron as ‘absolutely massive’ for the Coquetdalers. “I was a little worried before the game that it would be a banana skin for us because Stobswood have got so many good players, and are technically a very good side,” admitted Herron afterwards. So he was delighted with the hard work and dedication shown by the players as they all put in a shift to get the result. “The teamwork we displayed was one of the best I’ve seen - the passing and movement and work off the ball was tremendous and it’s certainly one of the best we’ve played all year,” said Herron. Laviers created the opening for Makin to tuck away the early opener in the 8th minute and Brown added number two with a coolly taken spot-kick after Laviers was brought down in the box just 6 minutes later to put Rothbury in control. Although star man Laviers was disappointed to have a goal chalked off in the 34thminute, Michael Old was instrumental in creating the chances for him to get on the scoresheet twice in quick succession just after the hour mark. “I was happy to grab a couple of goals,” said Laviers. “Michael broke through and went round the keeper then hit the post, it came back to him and he couldn’t shot but was unselfish and laid it off for me to finish, so a lot of praise goes to him for that goal. “Michael broke through again and his shot was saved, but I was there to follow in the rebound for the second. “I was happy to be involved with the other goals as well, with Makin tapping in my effort that was saved and Tony scoring the pen I won. I don’t think the game had a derby feel, I think it was played with respect for one another,” he continued. Herron also felt that lessons had been learned from the 2-2 home draw with Willington Quay Saints the Saturday before and that the side had implemented them on the pitch. “In comparison to the way we started last week, we dominated high up early on and got the goals in that period to warrant our high press,” he said. “We’re just taking it game by game and not getting ahead of ourselves. There are some really good sides in this league and we’re really just learning and adapting every week. We never expected to be where we are at this stage, and are doing our best to keep the momentum going.